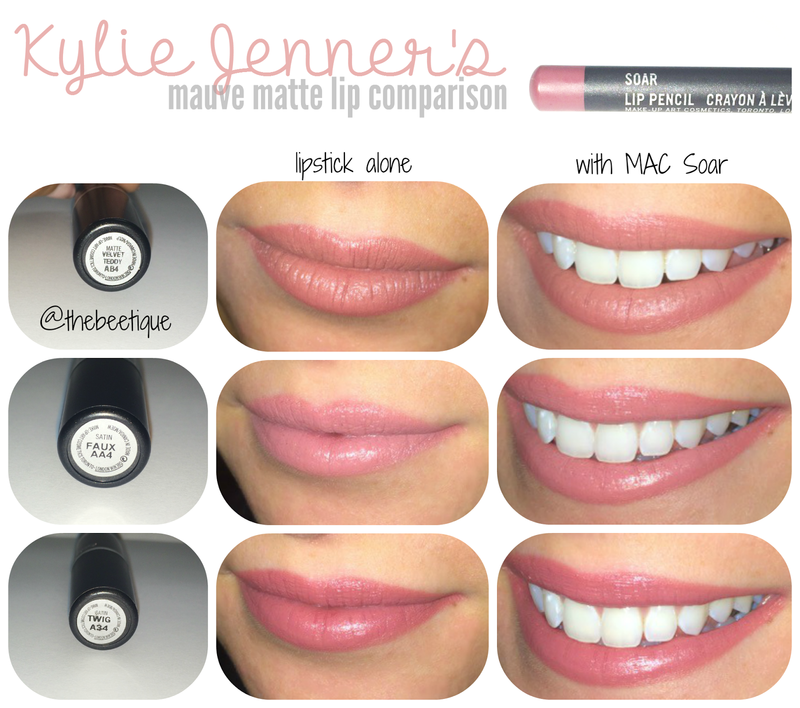 Kylie Jenner's mauve matte lips have been the talk of 2014 - and now 2015. We've heard of so many different MAC lipsticks that are rumored to be used for her mauvey-pout. But that can't be all she's using! SHHHH, I'm talking about lip liner, I know nothing else :-). The two MAC liners we're constantly hearing are Soar and Whirl, which are so hard to get your hands on now. Luckily, I had Soar in my possession before Kylie fans wiped them out. 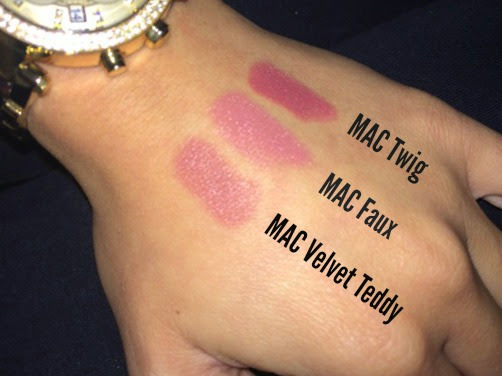 The lipsticks I chose to swatch for you today are MAC's Velvet Teddy, Faux, and Twig (from left to right). I made a comparison collage for you who are as curious as I was about the differences between the rumored colors. I'll show ya the swatches of the lippies alone and also together with MAC's lip liner in Soar, so read on to get the scoop! MAC Twig - My very first Kylie lip color will always have a special place in my heart (and my lipstick organizer). Although I'm a few shades darker than fair skinned, my lips are very light. So Twig, being the darkest out of the 3, isn't a natural color on me. My favorite part about twig is that it's dark enough to be used without lip liner, whereas the other two do. I wore Twig during my trip to Mexico, and it gave me that sun-kissed lips look. 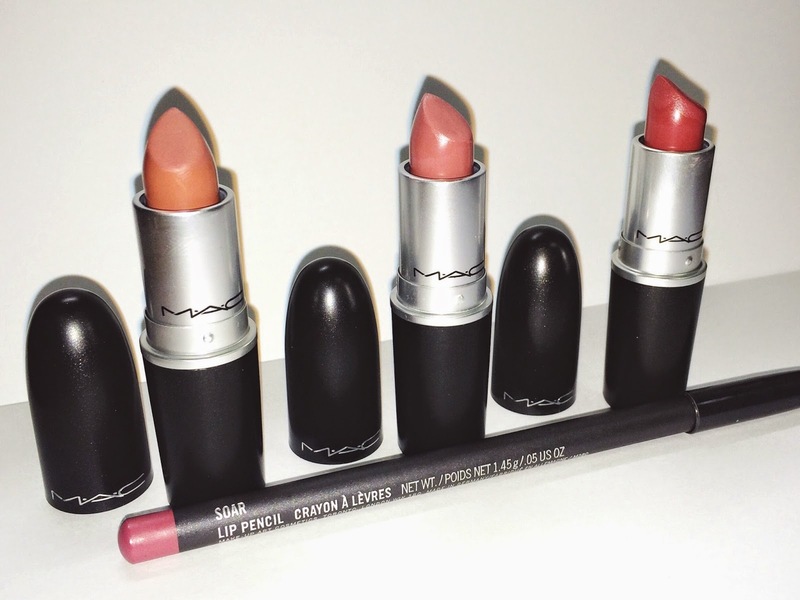 MAC Faux - LOVE. I'm not a huge fan of pinks on my lips, unless they're dark/hot pinks, but Faux makes me feel otherwise. It's the perfect pink that won't make you feel too Barbie. I wasn't really feeling the way Faux looked on my lips without Soar liner paired with it, but together, it might be my favorite MAC pairing by far. MAC Velvet Teddy - First off, Velvet Teddy has been so hard to find that I thought it was discontinued. I found it on Nordstrom online, which BTW offers free shipping, so go grab it before it's sold out. At first, Velvet Teddy was my least fav out of the three, and I didn't understand the hype... Until I stepped outside, looked in my car mirror, and realized it is the most perfect natural shade for me. Just like Faux, I can only see myself wearing Velvet Teddy with liner - But it is definitely my official "MLBB" (my lips, but better). Okay, so my pout will never be as big as Kylie Jenner's, and no combo will help me get close - but at least the liner did as best as it could. For awhile I was on the hunt for the many variations of lip color combos that Kylie is rumored to use, but the comparison was almost impossible. Naturally, I bought all 3 and decided to share them with you. See my other fav neutral lipstick and liner combo here!